A keeper. Very lightweight with many useful features. @smaragdus I'm not the developer, just another user here ;) I agree though it's a great app, use it almost daily. Thank you for developing and maintaining this nice tool! 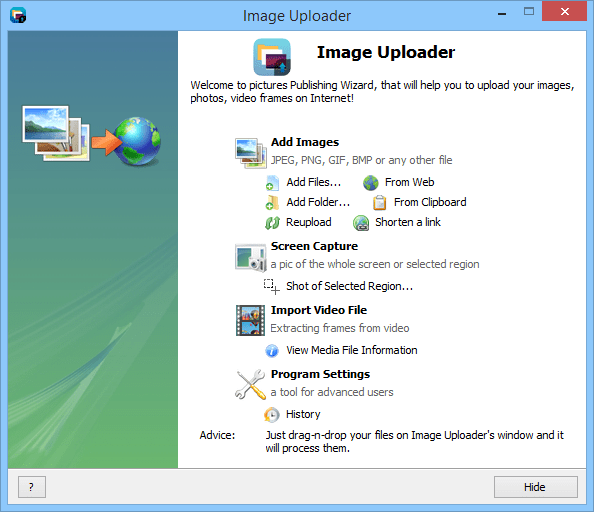 I appreciate its full portability, lightness and features so Image Uploader is becoming indispensable for me, your great work is much appreciated- congratulations and thanks! @smaragdus You're right, I've changed the download link to the main page which contains the latest build. The more I use Image Uploader the more I like it. In fact I was using the previous version- 1.2.9 Build 4183, which was more than a year old, I have just found there is a new release- I was searching inside its downloads page but the new downloads are from Yandex Disk. Excellent tool, I hope it is not abandoned. Anyone know what arguments this app accepts? Would like to be able to launch directly into 'Add Files' mode.